Anna Rook is so severely agoraphobic, she will not leave her home, even when home invaders break-in. Yet, why should she? Rook has greater home field advantage than the Green Bay Packers playing at Lambeau Field in the middle of a blizzard. 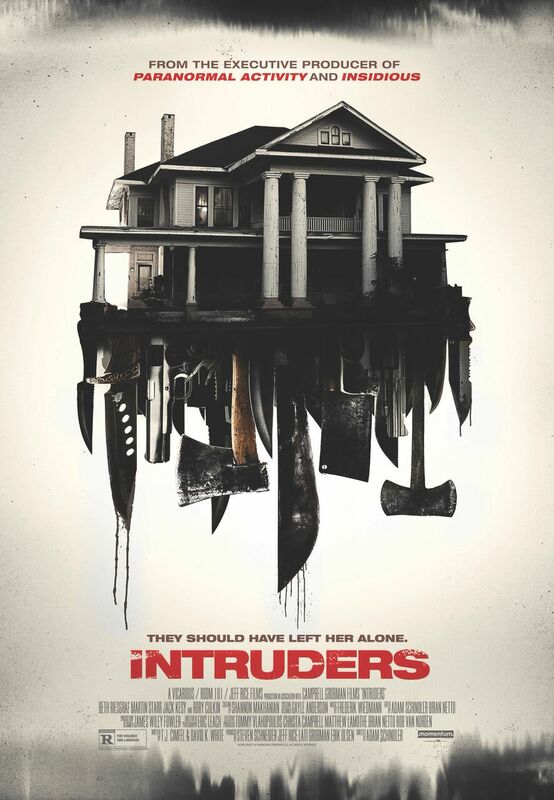 Her house has a few special modifications that her uninvited guests will learn about the hard way in Adam Schindler’s Intruders (a.k.a. Shut-In, trailer here), which opens tomorrow in New York. Rook has long cared for her terminally-ill brother Conrad, out of sibling love and dark secrets that apparently tie them together. Their only visitors are Danny, a delivery guy from a Meals-on-Wheels-like service and Conrad’s lawyer Charlotte, who is trying to get Anna to face up to the inevitable. When her brother finally dies, Anna’s condition remains unremitting, prohibiting her from attending Conrad’s funeral. It turns out Danny told three of his thuggish pals about the considerable amount of cash she keeps in the house, but neglected to mention her agoraphobia. They duly break-in expecting her to be at the funeral. Of course, finding the grieving Anna will not dissuade the alpha dog JP or the psychotic Perry from their mission. However, the more passive Vance is definitely thrown by her presence. His instincts will soon be validated when Anna lures them into the specially modified basement. It is really more of a dungeon and interrogation chamber, where the Rook siblings apparently lured pedophiles, like their despised late father. For the three outsiders and the late arriving Danny, it is sort of Rube Goldbergian nightmare. Frankly, it is a little hard to believe anyone could install a retractable staircase like that without attracting some sort of notice. Regardless of credibility, Schindler gives Anna plenty of remote-controlled doors and secret passageways, so he might as well let her take full advantage. In one of the coolest bait-and-switches ever, what starts as a horror film instantly morphs into an unapologetic payback thriller. It also has the extra, added attraction of inflicting a whole lot of pain on Rory Culkin (as the quickly remorseful Danny). Frankly, Culkin’s presence is fittingly ironic, since Intruders could be considered an evil cousin to Home Alone. The character of Anna Rook is kind of all over the place, but Beth Riesgraf certainly conveys how messed up she is inside. Likewise, as JP and Perry, Jack Kesy and Martin Starr are electric live-wires of despicableness. Seeing the tables turned on them is awfully satisfying. Intruders is not for the faint of heart or the pedantic. However, genre fans will definitely dig the way Schindler rolls up his sleeves and gets the job done. Recommended for those who appreciate its E.C. Comics-esque ethical convictions, Intruders opens tomorrow (1/15) in New York, at the Cinema Village.